Rick Vader Zwet of Christchurch with a fine looking 7kg tuna taken off Kaikoura on a lure. The exact species of tuna we are unsure about. It may be a slender or even a Bluefin? Albacore trolling lures. 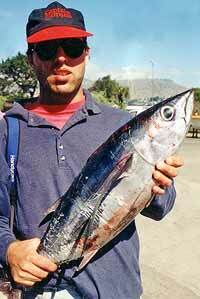 Albacore tuna are a species that regularly travels through our New Zealand waters. They are a hard fighting fish and excellent eating. In this article, we’ll look at some simple yet highly effective methods of making up, and rigging, albacore trolling lures. 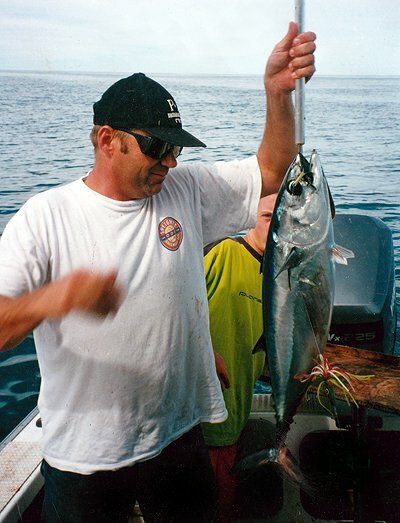 According to expert anglers experienced catching albacore a twenty plus kilo specimen fights harder than a yellowtail kingfish of the same weight. Now that is really saying something! 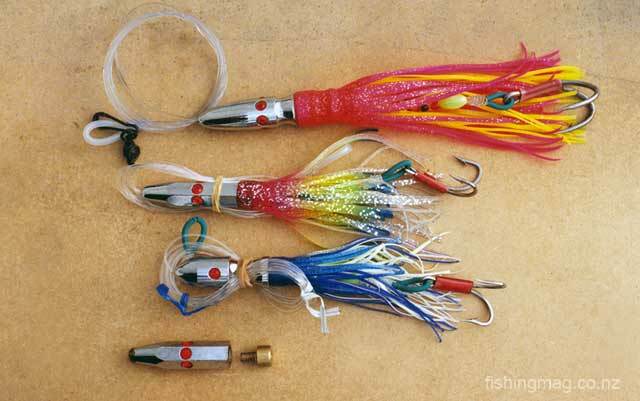 The best albacore trolling lures are bright and glittery. You want a lure that really sparkles. The name of the game is to raise the tuna to the surface. It has been said, that once they are excited, and “buzzing” around near the boat, they will take any sort of lure you care to toss over the side. Commercial boats create “excitement” on the surface by squirting jets of high-pressure water on the surface of the ocean. The albacore takes this for a school of bait fish, and they come up for a look. Once near the surface commercial fishermen take them on simple hex-heads and feathered lures. Recreational anglers can apply a similar ploy by dragging old car tires behind their launch. The tires need be only a few meters behind the boat to achieve the desired result. Returning to the albacore trolling lures themselves among the best are the small rubber “squid skirts” also known as muppets. These lures need have a total length of no more than 120mm (about five inches). Although the lure might seem quite small, it can be made very attractive with the addition of extra tinsel, a second inner skirt in a contrasting colour, and one or two other things that we’ll return to in a moment. Don’t forget we want our albacore lures to stand out and be noticed. We want them not only to take fish from the surface but to draw them up through the water column, as well. 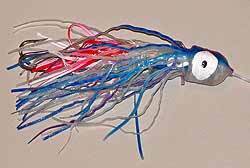 Small rubber “squid skirts” also known as muppets make excellent albacore tuna lures. 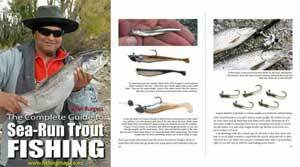 Top a 1 oz lead sinker forms the head while smaller skirts form the body. Botttom: The completed lure is 120mm in length. Albacore trolling lures. Start by taking a two-meter length of heavy 200 lb monofilament leader material such as Jinkai. This stuff is 1.28mm in diameter, so it is quite heavy and stiff. These days, there is a tendency towards using crimps to place loops in this type of heavy mono. If you do use crimps, it is vital that you have the correct size crimps for the diameter of monofilament you’re using. A crimp in mono means that the crimp must compress the mono, creating a potential weak spot. If you crimp too tight you risk a fracture in the mono. If you don’t crimp tightly enough, you risk the crimp slipping under pressure from a big fish! It is far better when placing a loop in mono to use a knot instead. The best knot for the job is the nail knot. It might be better described at a tube knot because a tube is required to tie it. The tube needs an inside diameter of no more than a couple of millimetres. The tube from an old ball point pen, a section of broken fishing rod blank, or a small bass tube will all do fine. Albacore tuna lures made with muppets. Take the mono and form a loop with the tag end about half a meter long. As you become more proficient at tying this nail knot you can shorten the tag end to 30cm. But until you have tied the knot a few times, the longer tag will make things much easier. With the loop formed, place the tube in your hand along side the loop. Now bend the tag end back again so it is facing away from you. Wrap the tag end around the first loop working away from you; up to­wards the other end (see Dia.). Form from 5 -7 turns – no more – and then push the tag down through the tube. Slide the tube out from the knot and then begin to apply tension to the tag end. The knot will begin to form. At this stage don’t apply too much pull on the tag because you want to be able to slide the knot along the line to tighten the loop. Too much tension on the tag at this stage will cause the line to fracture when you slide it along. Coast lock ball bearing swivel. I didn’t mention it earlier in order to avoid confusion, but we want to slip a length of armour spring on to the line before tying the nail knot so that it ends up in the loop. The purpose of this is to provide protection for the monofilament at the point where the hook, at one end, and the Coast Lock swivel, at the other, would otherwise rub against it. About 35mm of armour spring is needed to go around the loop. You can also use the insulation from electrical wire for the job if you want a cheaper alternative. The armour spring is quite inexpensive, and, in my view, is the best thing to use. Albacore trolling lures. Rigging of Hex Head for albacore tuna. Simply slide the knot up against the armour spring and then apply more pressure on the tag end. I wet the knot so that it forms up nice and tight. Pull on the other end of the mono as well, to help tighten the knot. You don’t need heaps of pressure to tighten the knot because the pulling fish will cause the knot to tighten down even more! How­ever, you’ll still need pliers to tighten the knot. The goal it to have good neat coils in the finished knot. 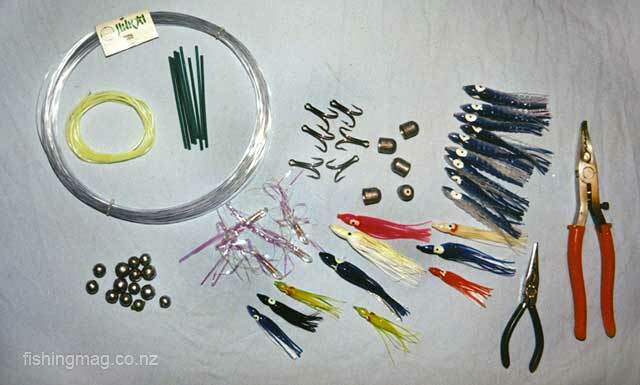 All the components needed to tie up a batch of “muppets” for albacore tuna trolling. You can see from the picture that our next job is to build-up the lure by sliding on, firstly the biggest rubber skirt, into which has been passed a lead head with a hole in the centre. You can buy purpose designed lead­heads for the job, or you can make use of one-ounce lead ball sinkers. Next, slide on a Tinsel Head Lure. These are from the Dynatec range. They really sparkle and shine in the sunlight and add considerably to the attractiveness of the lure. This is followed by a smaller rubber skirt, preferably in a contrasting colour. Next slip on a couple of beads or plastic tube to act as spacers. The idea is to tie the loop at the other end and have the hook finish just inside the skirt. Albacore tuna caught off Canterbury. The best hooks to use are Mustad Stainless Steel #7982HS in size 4/0. These hooks are more than adequate for albacore. This species grows to a maximum weight of about 35kg. So you don’t need massive big hooks. These are twin hooks, and the barbs ride facing up through the water. Surprisingly, it doesn’t seem to matter which colours are used for the skirts. The skirts in the photos are Golden Bait Skirts, made in Japan. These have flecks of glitter through them and they really stand out. You can even dress-up the hooks by wrapping them in reflective foil and slipping a short length of clear plastic tube over the foil to hold it in place before tying them on. Every little bit helps! A double knot, measuring one and a half rod lengths, is tied on your line and a Coast Lock Ball Bearing Swivel is tied at the end. On to this, you clip your meter long albacore rig. The rig is trolled behind the boat just 5 meters back. The idea is to keep the ball bearing swivel up out of the water. This means that the tuna are going to have to come right to the surface to take your lure! The best boat speed should be about 6.5 miles per hour. There you have it. Coil them up as you see in the picture and store separately in plastic bags. The cost is just $5 per rig. The stainless hooks mean that the used rig can be washed in freshwater and stored away for the next trip. I hope you have a go at tying these albacore rigs. They are great fun. Half a dozen, or so, packed in your gear could come in handy on your next albacore fishing trip to sea. Commercially available Hex Head lures suitable for albacore tuna. Note it is best to rig your lures “ready to fish” at home ahead of time rather than waste valuable fishing time while at sea. Here is our main albacore tuna page.